Plowing, Blowing, or Removing Your Snow? 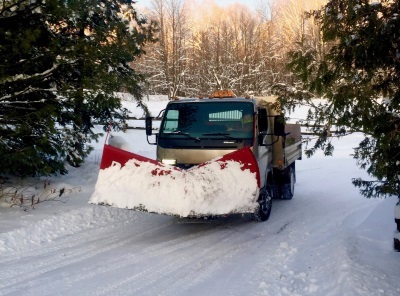 It may seem that plowing, blowing, and removing snow are one in the same, but the three options for clearing snow are very different, and each have varying pros and cons. Depending on lot size, if it is residential or commercial, and the structure of the lot will help decide what method is best for you. Plowing snow is the act of pushing snow off of one surface and piling it onto another. For example, in a large parking lot, plowing snow means piling it into one designated area to clear the rest of the lot. The benefits of plowing snow for the client mostly comes down to cost, especially the larger the lot. Smaller lots have a more comparable price to blowing, which is a superior option. When plowing, the plow does have a chance of scraping the asphalt under it, as well as damaging curbs and grass. Where snow is piled can also cause issues when it melts in the spring. Melting snow can flood grassy areas, overwhelm drainage, and cause damage to foundations. Snow plowing does, however, provide speedier service blowing or removing snow, so getting your lot plowed will be most efficient during snowfalls. Considering these factors, plowing is best suited to large lots, which are well maintained before snowfall, and have a safe place to pile snow. Blowing snow is more costly than plowing, especially with larger lots, but the results of blowing snow is superior. Blowing snow almost never damages asphalt, curbs, or grass – unlike plowing. Blowing snow also does not leave the large, unsightly, and sometimes dangerous piles of snow, which plowing piles up. Instead, the snow is dusted in manageable amounts along curbs and away from parking lots. These manageable mounds of snow help with visibility in lots and around corners and can stop a devastating accident before it happens. Manageable snow drifts also means that in spring, when the snow melts, it will cause less damage to grass, drain appropriately, and will not cause damage to foundations or flood basements. Blowing snow is more time consuming than plowing, though, and unless it is a small commercial lot, or residential property, then plowing may be the more economical choice. Snow removal is the vastly superior option for large lots, or lots that do not have an appropriate place to put plowed or blown snow. Snow removal is not just moving the snow to somewhere else on the property, like with plowing or blowing, but is the practice of removing the snow from the property and trucking it elsewhere. Snow removal is by far the most expensive option for plowing lots, but it is the safest for customers and for lot accessibility. It also means that parking spaces are not sacrificed to piles of snow. There are also instances where plowing or blowing are not possible. Plowing is difficult, and trucks cannot easily turn when pushing piles of snow. If the plows cannot properly do their job then it is not an option to use them. If there is not adequate space to store the snow on site, it also has to be removed. Snow removal is a great option in these instances, as it keeps properties safe that otherwise would have dangerous lots. Plowing, blowing, and removing snow are not one in the same, and there are pros and cons to each. Cost, lot size, and property design are some of the biggest factors in what option is best for your snow removal needs, and we at Schlager Excavating & Haulage are here to provide you with the advice you need to select the best service we offer. We can keep your lot clear and safe this winter.